ant to build cannonball delts like the strongmen of the 50s and 60s? The barbell shoulder press shows you how. While an effective abbreviated routine will commonly target all the major muscle groups, including your shoulders, the typical trainee can sometimes benefit from specialized shoulder work. So what is the best shoulder exercise when targeting the deltoids? It's a proven muscle builder made famous by the strongmen of the 50s and 60s. The behind neck press, standing or seated. Since these options are all effective, choose the one you can work hardest, and feels most comfortable for you. For example, the seated variations of the shoulder press are offered not as a way to make the exercise more strict, but as a way to take the strain off the lower back. The trick is to find that overhead shoulder press variation - either standing or seated - which best suits you. 1. Lift Big. Just like the strongmen of yesteryear, don't be afraid to use really big weights on your overhead presses. How heavy? Randall J. Strossen in his bestselling book "Super Squats", described how Mel Hennessey did an extremely strict standing press the neck with 300 lbs; and the lifting giants of their day like Paul Anderson, Chuck Ahrens, and Doug Hepburn, were all capable of pressing close to 400 lbs behind the neck. While it is unlikely the typical trainee will ever join such exalted company, it provides a stirring example of what is possible. 2. Begin Light. When you begin the barbell shoulder press for the first time, use light weights until you have mastered good form. This is especially true for the press behind the neck. The behind neck press is a fantastic and effective shoulder exercise, for those who are able to do them. If for whatever reason, the press behind the neck causes you concern, consider switching to its safer cousin, the barbell overhead press in front of the neck. 3. Abbreviated is Best. Please beware your training frequency, as excessive training volume will damage your shoulders. While the overhead barbell press is a fine exercise, when added to an already vigorous abbreviated program where the chest, back, and legs are rigorously worked, this additional pressing exercise can sometimes demand too much. Instead, a more prudent and safer option, is to periodically substitute the overhead press for the dip exercise or your bench press. By doing this, you continue to work your shoulders while avoiding over training. Important: if you are over trained, you run the risk of injury. Please don't do it. Instead give your shoulders plenty of resting time. 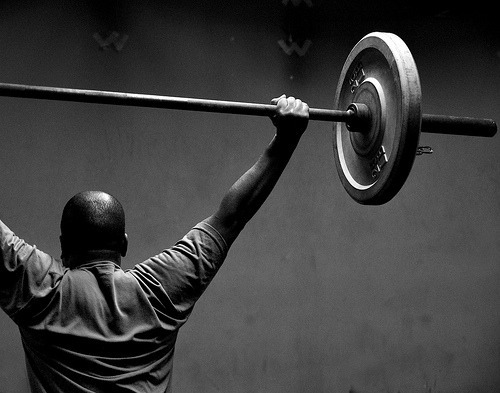 Overhead presses with a barbell is the name of the game, when looking to build your shoulders strongmen style. Want to build cannonball delts like the musclemen of the 50s and 60s? Let the barbell shoulder press show you how.